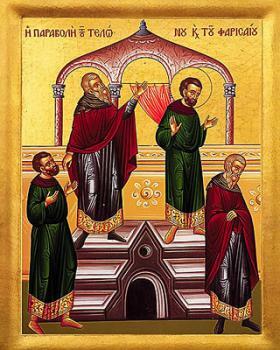 O Lord, Thou didst reproach the Pharisee when he justified himself, boasting of his deeds; and justified the Publican when he approached humbly, seeking forgiveness with sighs; for Thou dost not draw near to arrogant thoughts, nor turn away contrite hearts. Wherefore, we also kneel before Thee meekly, O Thou Who didst suffer for our sakes. Grant us forgiveness and the Great Mercy. When the Pharisee went down with empty glory, and the publican bowed himself in repentance, they came to Thee alone, O Master. But the one through boasting lost his reward, and the other by his silence deserved gifts. Wherefore, by those sighs confirm me, O Christ God, since Thou art the Lover of mankind.